Veranda apartments at 6015 W. Olive Ave in Glendale have been sold to a California investor for $6,816,000. This marks the new owner’s first Arizona investment and he plans to substantially modernize the popular community. Koskovich, Bill Kahn and Jeff Sherman negotiated the sale transaction. Western Wealth Capital of Burnaby, British Columbia sold the Veranda to Margreen Properties LLC of Corte Madera, CA. Veranda was built in 1972 and contains 120 apartment units in 12 two-story buildings. Situated on 3.231 acres of land, the community offers studios, one and two-bedroom apartments ranging from 450 to 1,150 square feet in size. Veranda is a gated-access property that features a swimming pool, laundry facilities and a combination of both covered and uncovered parking. Veranda was 95% occupied at the time of the sale. Located on West Olive Avenue just west of 59th Avenue, Veranda is surrounded by a mixture of single-family homes, multifamily projects and commercial/industrial developments. This middle-income neighborhood benefits from a nearby WalMart Supercenter and abundant other retailers at Northern Crossing Shopping Center. The community also is located conveniently to Downtown Glendale, complete with municipal buildings and its active old town district. 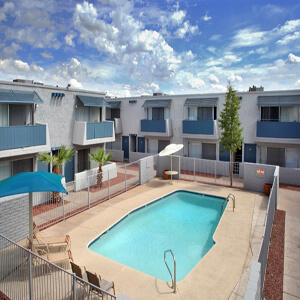 Veranda is close to a variety of educational institutions, ranging from elementary and high schools to Glendale Community College, Grand Canyon University and the West Campus of ASU.